Anne blogs at Front Porch, Inspired about surrendering everyday living for sacred purposes. 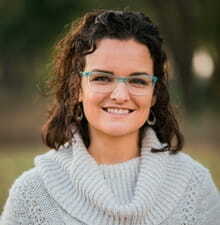 She and her husband, Jay, are founders of a ministry called The Bridge, focusing on missional living and advocacy for youth in vulnerable places of life. She holds an MA in Teaching Languages (TESOL and Spanish) and is a lover of words and the Word, culture and communication. Jay and Anne have five kids, a front door that can’t stay closed, and an abundance of messy, holy chaos at their neighborhood center/home in Iowa – of all places. We started life at Seneca Center with hearts full of passion and the best of intentions. Life here is one of the most beautiful things that has happened to Jay and me and to our kids. It’s the most right thing in our messed up world, I suppose. Yet, I guess it doesn't look that way - not from the outside. Because, we get pity-looks. We get comments centered around how “difficult it must be” – this type of living. But, no friends, it’s not this that is difficult. We are most at home, most comfortable, here – drinking sugary tea, eating now-familiar dishes, being part of a village-like life dropped into small-town Iowa. In fact, sometimes I sit on my porch swing, and I watch the kids running barefoot, with spices lingering heavy in the air, and I am the most at peace, here. But the real challenge? The tension that pulls us thin? It's what happens when we must leave our street and navigate our other world - the North American church world. And, we must, because we live here, and it’s inevitable. I must leave my house, the one that doubles as a youth center, and try to wrap my mind around how the kids whose bare feet were just parked under my table will ever be welcomed in the local churches' youth groups. But, please, not just to be tolerated – but to belong. I must leave my kitchen, the one that receives those okra and lamb and rice and such dishes, and try to wrap my mind around how these ladies would ever experience Christ in the church women's culture of lovely events and conferences and retreats with matching napkins. I must leave my driveway, the place where the boys shoot baskets like their NBA heroes and the men yell about politics in South Sudan – and try to wrap my mind around how any of these guys will come to reconcile their identity in Christ, much less in their culture, if it depends even in part on the discipleship efforts of the local churches. If I could just stay put on my street – stay in my neighborhood – life would make sense. Or, if I could just stay put under my steeple – in my church world – life would make sense. But, I can’t make sense of this North American Christianity when it butts up against the real world of our life. I can’t understand the programs and the pew-sitting and the show-making that foster greater and greater belonging for the already belonging – while the outcasts remain cast out. And, I suppose, sometimes I’m tired of fighting to engage the church world. It is how it is. Maybe integration is but a dream. Maybe barges can't change their course. Maybe some churches are just best serving the population they most resemble – white, educated, wealthy, coffee-drinking folks. But, maybe not. Maybe it’s not too much to ask? Because, I still believe in church – believe that real community can happen because of the Cross, and a local church actually can reflect the local population, crossing all kinds of barriers. But, it doesn’t happen with programs. It doesn’t happen by paying a professional religious leader with a string of letters behind his name and expecting him (or the local missionary couple) to bring in the different skin tones and make sense of it all. It doesn’t happen by buying a building, putting up a sign with the word “CHURCH” and having a grand opening weekend. It doesn't happen just because there is money available in an account or a vacant spot on the denomination's map of its churches. Church happens when the Gospel is freed from how it’s always been and lit up on the streets. Church happens when people dig deep in the mud of messy lives, culture, relationships, tragedies and victories. Because, church sprouts from relationships and living, with authenticity and depth - but it can't be programmed or controlled or launched into existence. Real church must be cultivated in sacrifice, on the ground-level, working life together alongside people with dirt under our nails and God-purpose beating invisible in our hearts. And, it happens when average people are willing to lay aside their comfortable culture in respect of the all-inclusive Gospel culture. It happens when everyday people are brought up as disciples who follow Christ to the outcasts and the broken and the unloved. It happens when we stop - intentionally, if necessary, stop - associating exclusively with “our own” and start seeing everyone as human, friends, part of God’s family. It happens when a passion for God's glory among the nations divinely surpasses the passion for comfort and familiar and control. So, you ask how we could ever survive the dozens of kids, ridiculously muddy front lawn, or steady knocking at our door? It's doable. There's purpose in it. There's a sense of calling and abundant, lavish Grace from His hands for the people in our world, those close to His heart. For, there is the Church, in all her beauty, theological knowledge, stability, and prosperity -yet absorbed in her own matters. Far too long has she shied away from the streets, from the neighborhoods, from the halls of businesses, schools, and jails. But, may she be given ears to hear and feet to go, for there is a far greater purpose to which she is called. A calling that trumpets hope to the nations and salvation to the souls, those leaning in for a word of this Good News she's carrying. It's time for the Church to take her place & take her ground-from steeples to the streets. Will we move beyond ourselves? Will we step out of our world and into another's? Church, are we eager to see the Gospel lit up on the streets? Are we obsessed with the idea? Consumed enough to sacrifice our gain for the sake of His glory? Oh Jesus, Immanuel, the One who came and dwelled among us. Teach us how to dwell among, how to go to, how to let go of our independence and self-focus. Help us to cultivate relationships and highly esteem the beautiful, messy, desperate stories-in-skin living all around us. Make us passionate about whatever is on Your heart - whatever the cost. Help us be Your church, active and alive. And, may we never forget the real tragic case is in our own hearts – not the one on the street – for it’s us, the broken and the outcasts, that You came to pull nearer. May this truth echo in our everydays. Amen.